Ergobaby Cool Air Mesh - The Cool Air Mesh baby carriers are made for the adventurer in mind! These carriers are the perfect choice for spending time outdoors, be it strolling in the park or hiking up a mountain. Thanks to the moisture-wicking mesh lining, baby and parent are both able to stay cool while exploring. This is a lightweight baby carrier that can accommodate taller and larger babies in the back carry with its curved shoulder straps. Like the Original baby carrier line, the Cool Air Mesh baby carrier can be used in the front-inward, hip, and back carry positions, but it really shines in the back carry position. Ergobaby Original - The Original baby carrier is a classic, tried and true favourite and is a great choice for everyday adventures. 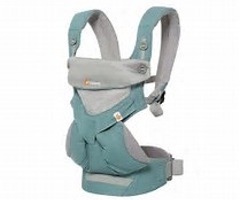 This carrier is wonderful for any and all activities- it's a jack of all trades!The padded shoulder straps and comfortable waistband allow caregiver and baby to adventure safely and comfortably…and not to mention in style! We offer many colours and patterns, so you're certain to find something perfect for you and your little one. The carrier can be w#orn in three positions: front-inward, hip, and back, so you're able to switch it up as baby grows. And with the newly redesigned Ergobaby Infant Insert, it is useable with your baby early in childhood (7-12lbs) until baby has strong and consistent head and neck control, and without an infant insert it is usable up through toddlerhood (from 12-45lbs). Ergobaby Adapt - Ergobaby's first ever insert-less newborn-ready baby carrier gives you the renowned comfort and ergonomics for baby and parent, and an innovative ergonomic seat that gradually adjusts to your growing baby. The new Ergobaby ADAPT is easy-to-use, from newborn to toddler (7-45 lbs), no insert needed. Extra-padded crossable shoulder straps and lumbar support waistbelt offer a new level of convenience and comfort for parents. 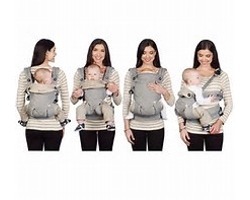 Ergobaby 360 - The all position 360 Baby Carrier allows parents to wear their babies in four different positions; front-inwards, front-outwards, hip and back. With the unique, structured bucket seat, baby will always be in an ergonomic frog-leg, seated position with her spine in an optimal "C" position, which allows you to wear baby facing outward safely and comfortably. 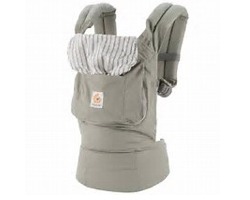 This carrier can be worn in conjunction with our Infant Insert from 7-12 lbs, and until your baby is 33 lbs.